Hi Exchange admins! Let’s focus today on the next feature of CodeTwo Exchange Rules Pro which definitely deserves your attention – the status bar in your Template Editor. As you already know, CodeTwo Exchange Rules Pro is an e-mail management software, providing a sophisticated Template Editor that allows you to create beautiful and stylish e-mail signatures, banners and footers. Bearing in mind how important it is to maintain a professional look of your brand identity, the application has been equipped with highly advanced edit features that let you efficiently and pleasantly work even with the very complex signature layouts. See below an exemplary e-mail signature, imported from the built-in signatures library of CodeTwo Exchange Rules Pro. The next thing you are most likely to do, is to go to the top ribbon’s section called Font and select a proper font type, size, colors etc. Will it work this way? Yes, it certainly will work in this case, but how about modifying the table’s cell or row? You will not do it analogically, because the visible ribbon’s settings do not apply to the HTML elements, such as row, cell or a whole table. 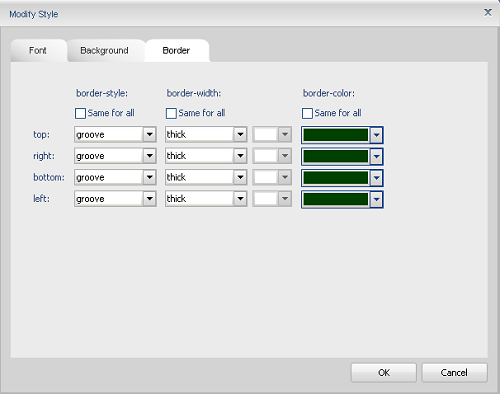 If, for example, you want to change a background color of the chosen single cell, you should now look at the bottom bar of the editor. It is more functional that you may expect as it displays the selected HTML elements of the table, e.g. <BODY>, <TABLE>, <TR> or <TD>. See in the picture below, the whole cell is being selected, so the <TD> element is being highlighted in the bottom status bar. As you can see, each HTML element of your signature or footer can be modified within a few clicks. This is all you need to know about the status bar. Just remember that this feature is always at your fingertips to streamline your design work when making complex e-mail signatures. 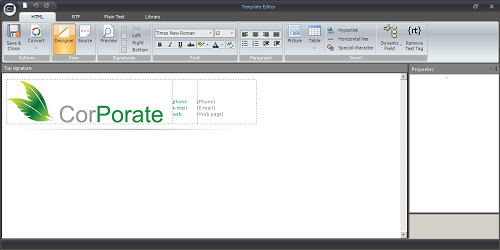 If you want to find out more about Template Editor’s functions, see our user’s manual. If you do not have a program yet and wonder if it suits your company’s needs, go to the program’s information page and see all its main features. Thanks Eric, glad to ‘hear’ that! Are you using CodeTwo Exchange Rules Pro?